Don't be surprised if you hear some familiar voices while playing through The Evil Within : Bethesda Softworks has released a new "Voices of Evil" trailer revealing three well-known actors who will take on the game's most prominent roles. Bethesda announced today that the "lead protagonist" of The Evil Within, veteran police detective Sebastian Castellanos, will be voiced by Anson Mount , known for playing [correction: former Confederate soldier] Cullen Bohannon on AMC's Hell on Wheels. His partner, junior detective Juli Kidman, will be played by Jennifer Carpenter , who portrayed Debra Morgan, sister to the lead character in AMC's serial killer thriller Dexter. Finally, Jackie Earle Haley , best known as Rorschach of The Watchmen, will provide the voice of Ruvik, the game's evil antagonist. 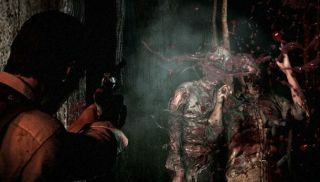 "One of the most crucial elements to any successful survival horror game is the setting and sound, which includes the depth and authenticity of the voice acting," designer Shinji Mikami said in a statement. "We brought together a great cast of experienced actors to help ensure that players really believe our characters' emotions and the tension they feel in every scene." I'm actually not a big fan of hiring Hollywood talent to provide voice work for videogames. The name recognition factor may have some PR value but I don't recall any instance in which it really made a positive difference to a game, and in some cases it's even a distraction, like when Patrick Stewart played Emperor Whatshisface in Oblivion . Jackie Earle Haley is pretty cool, but can he really bring anything to the game that a relatively anonymous voice acting pro couldn't? The Evil Within comes out on October 14.